Older generations familiar with rural life in Lithuania describe how the Christmas season was traditionally one of tranquility, a time for quiet meditation. This kind of peace is hard to achieve in the frenetic urban environment. Throughout the centuries following the introduction of Christianity in Lithuania, Advent and Christmas customs have preserved their magic even though the majority of Lithuanians no longer live in the countryside. 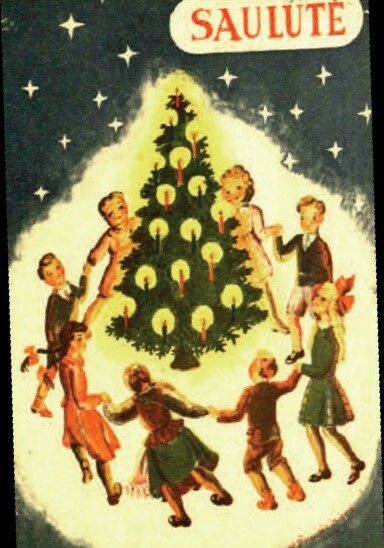 As a Displaced Person who arrived from a German refugee camp to Boston in 1949, my memories of a traditional Lithuanian Christmas come from stories told by my maternal grandparents who lived with our family until they passed away. Together with my parents they kept the magic alive and inspired my interest in folklore. According to 19th century folk calendars, the beginning of winter was the Feast of St. Andrew, November 30. Advent also began on this day. Vernacular folklore taught that this darkest season was full of secrets, perils and anticipation. The faithful fasted during Advent and eschewed frivolous fun in order to avoid meeting the evil roaming spirits. On Sundays during Advent parishioners went to early morning Mass known as “rarotai,” while those who remained at home sang the rosary. In some places the rosary was sung in the evenings by villagers who would gather in someone’s home or the granary. People liked to sing together in the evenings while the women did their spinning, and young people prepared the hope chest for a future bride, which contained feather pillows, newly sewn garments and woven sashes. Historical sources indicate that the singing of religious hymns may have begun as early as the 15th century. Choral singing was vibrant in the Cathedral of Vilnius, where in 1501 the Franciscans celebrated eight sung masses during Advent. In 1547 Martynas Mažvydas included hymns in the first book printed in Lithuanian and prepared a large hymnal as well. As literacy improved, people learned the words of many verses of hymns and easily learned the melodies. Some hymns were sung by all the faithful in church, while others were sung by a special group known as “giedotojai,” usually literate hymn singers with good, strong voices. During the first decades of the 20th century, the hymn “Eik, Adomai, jau iš Rojaus” (Adam, it’s time to get out of the Garden of Eden), popularized during the 19th century by Bishop Motiejus Valančius, 1801-1875), was often heard in the Lowlands and Suvalkija. 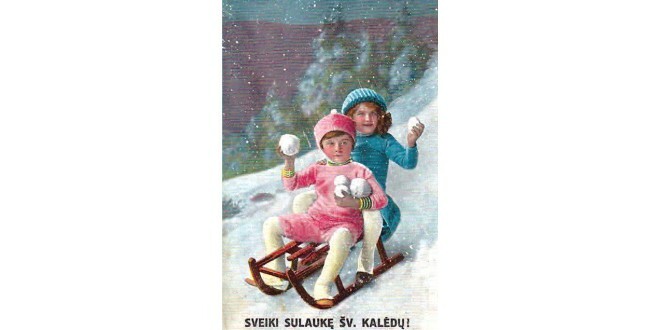 Hymns sung before World War II, such as “Sveikas, Jėzau gimusis,” “Gul šiandieną” and “Tyli naktis” are sung until today in Lithuanian parishes. During the 19th century Christmas Eve was considered a family celebration with the entire family present at the holiday table and a place set for those departed, thus enabling everyone to socialize with their ancestors. The cottage was thoroughly cleaned and juniper branches scattered on the floor. Branches of evergreens covered beams and joists in case the spirits came. A special seat behind the table across from the oven was known as the “krikštasuolas,” a place of honor. The shelves behind the seat contained various religious articles, such as a small cross, prayer books, hymnals, devotional pictures, and important estate documents. This corner of the room was considered the center of the domestic space. During ordinary days, the head of the family would sit here and slice the bread. On Christmas Eve an unthrashed sheaf of wheat, signifying good appetite for the family, was placed in this special corner of the room. In addition to spreading straw under the white linen tablecloth, a thick sheaf of wheat would be placed under the table for the souls of ancestors to perch on. On Christmas morning the same straw was tied around the apple trees that they might bear abundant fruit. It is possible that the decoration of a Christmas tree began for the purpose of pleasing the visiting souls. Decorations originally consisted of apples, nuts and sweets for the spirits, and the burning candles would have provided light and warmth. During Christmas Eve the souls of the departed were particularly active and could influence the living, reveal secrets and predict the future. Thus on Christmas Eve young people would light a wax candle and look inside the bread oven to see an image of their future spouse. One of the archaic rituals was to walk around the house three times with the special food prepared for Christmas Eve. Another ritual known throughout Lithuania was for a young woman to take a light wooden harrow and run around the house three times (preferably naked). Then she must look through the window into the house. If she saw young people sitting at the table or dancing, she will marry. If she hears hymns sung inside, someone will die. The custom of telling fortunes especially about marriage, death and future harvests is still practiced. Birch logs were placed in the oven to smolder all night until Christmas Day and particularly hearty food placed in front for the spirits. 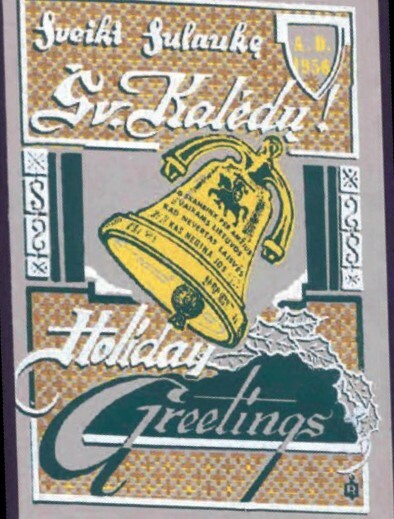 In the folk calendar the old year ended with Christmas Eve. The sun returns on Christmas Day, and that is why it was important to predict the weather in the coming year, the abundance of crops and the reproductive fertility of the animals. Folklorists of agrarian customs believe that the various celebrations on Christmas Day – particularly the visits of characters dressed up as bears, goats or horses – derive from pagan rituals worshiping the return of the sun. Christmas Day consisted of visiting and welcoming guests. A parish priest on his annual rounds would receive a wide sash (“juosta”) with pickup patterns woven by the p e a s a n t women. Children bleating like lambs would walk around the village outside the windowsills of cottages and received sweets. If one of these “lambs” bleated at a particular window, it would be a prosperous and lucky year for the residents of that home. 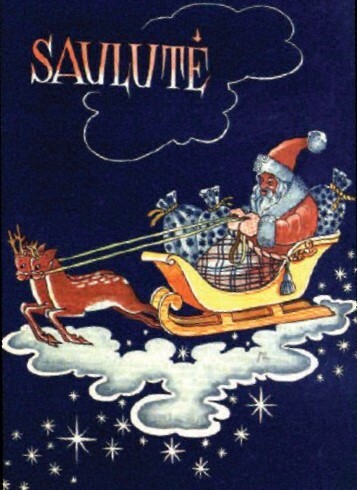 One of the sources for Christmas stories in the Displaced Persons camps was the publication for children Saulutė (Sunlight) edited by Antanas Giedraitis-Giedrius, 1892-1977. 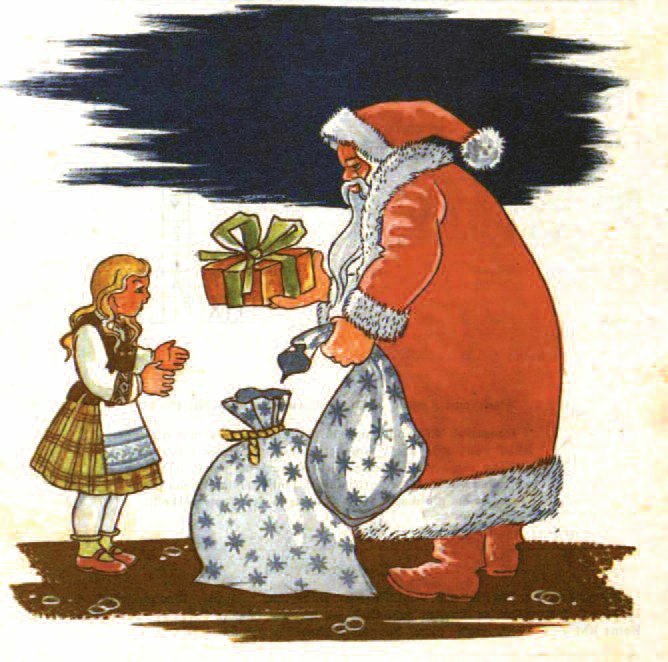 Saulutė was acontinuation of a children’s magazine that had been published in Lithuania some 15 years earlier. In exile, the monthly magazine was published in Detmold, Germany, and contained some of the best history lessons and literature for children. Giedraitis wrote, “Our youth in exile hunger for nourishment of the soul.” Saulutė, indeed, nourished the soul. My favorite Christmas story appeared in the December issue published in 1946. “Grigo ratai (The Big Dipper)” by Jurgis Jankus, 1906-2002, begins with a dark winter scene in which an old cottage covered with moss stood near a grove of spruce. An elderly widower, named Grigas, lived there all alone, forgotten by everyone. His sons had died in the war, and his wife had died of a broken heart. All he had was a small cart and an old, old mare for hauling firewood from the forest. One evening during a blistering snowstorm, there was a knock on the door. Grigas didn’t answer it right away because he thought he was hearing noises. When the knock repeated, a surprised Grigas opened the door. A tired man entered and collapsed on the bench. Grigas scratched his head, smiled and thought to himself, “It’s good that God sent you. You may rest, although perhaps not in such comfort as you would receive in a wealthy home. And I will have someone to share the bread with.” Grigas called the bread the cake of God, the Master. His visitor spoke up and told Grigas that he was, indeed, very tired as he had been walking great distances to reach home in order to be with his family on Christmas Eve. He had asked various people for a ride, but everyone was too busy with their own holiday preparations. The visitor described that he had not seen his family for 25 years because he was in service to the king. Now that he was ill, he was released and concerned that his family would not even know if he was alive. Grigas felt sorry for the exhausted traveler and offered him a ride with his old mare. “Of course,” he said, “She would not be able to gallop like the horses of wealthy estates, but we could trudge along.” “But how will I repay you?” asked the visitor, “I don’t have anything.” “Let’s not talk about paying me back. I just don’t know what to use as a vehicle. It’s been snowing but the road seems to be bare still, but the wind probably blew some drifts.” The visitor suggested taking the cart, since the road seems to be pretty bare. Grigas hitched up his mare, covered thevisitor with all his furs and wrapped his feet in a blanket. They rode off, and Grigas was surprised to see deep snow on the fields and the branches of fir trees bending low with the weight of snow. But the road was clear. His mare trotted on past the grove of spruce and reached a huge swamp. There was a good road through the swamp. However, as soon as the wheels of the cart rolled onto the road, they sank deeply into the mud and got stuck. The mare tried to move with all her might but to no avail. The passenger suggested that a second horse might pull them out, but since there was none, he had better walk the the way. Grigas objected and went to two neighbors to ask for a horse. They simply laughed at the thought. The third neighbor struck a deal with Grigas. “I’ll give you a horse, but you must give me your garden.” Grigas agreed; he was in a hurry to return to his cold passenger. Grigas hitched up the horse, but after a few steps the cart again sunk into the mud. The storm worsened, and though the wind howled there was still not one snowflake on the road. The passenger dozed off smiling, his face full of light. Grigas returned to the farmer and asked him for a second horse. The neighbor figured that there must be something very precious in the cart, possibly a bag of gold, to cause Grigas to beg so desperately for another horse. “Are you carrying the devil?” he asked Grigas. “No, only a man who longs to return to his family.” The neighbor didn’t believe him, but gavehim another horse in return for Grigas’s cottage. Grigas grabbed the reins of the horse and returned to the cart. His passenger’s face was even brighter than earlier. “This cannot possibly be the devil,” he thought to himself. He hitched up the third horse, and off they went. The cart began to sink again, but suddenly Grigas felt the road bending under their feet. He shouted, “Almighty! Save one who is drowning!” He jumped onto the middle horse. The horses stumbled, but began to gallop away. Soon there was no sound of the wheels of the cart. The wide white fields began to glow with a spectacular light. Grigas turned around. There was no traveler in his cart, but a beautiful infant, whose entire being glowed with radiance. Grigas tried to stop the horses in order to kneel before the child, but the horses galloped so fast that his head was spinning. The child spoke, “You don’t have to stop the horses. It’s all right. There’s nothing to return to. The wealthy are laughing at you. I would like you to travel among the stars in the heavens and show the way to those who are lost.